Katch International was appointed to help with the branding for this new concept of theirs and the brief was simple – we needed to create a brand that reflected international standards but still stayed true to its regional roots. With this in mind, we came up with a contemporary monochrome logo and the name Studio 77, which is an ode to the street number the brothers grew up on that now serves as the studio’s address. The logo also embodies the chic essence the Sharawis were so keen on capturing and incorporates a camera’s viewfinder icon. While zeroing in on a name, we were conscious of the fact that we needed to communicate that the Sharawi’s latest offering was not just restricted to kids’ photography but also extended towards diverse areas such as photography for weddings, families, schools and nurseries, corporate clients and products. This led us to choosing an elegant colour palette for all branding collaterals that featured black, white, grey and bronze. With one-and-a-half years of experience running a brand that focused on childrens’ photography, brothers Hamad and Abdalla Sharawi have steadily built a loyal clientele and reputation for themselves. 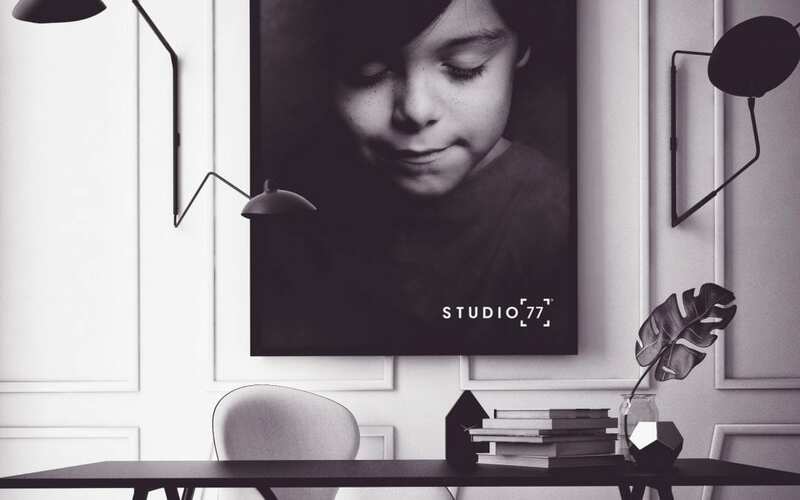 The seed for their new venture Studio 77 was born when they realised that Dubai has a pressing need for photography at a luxury level. Studio 77 is an attempt to diversify their areas of expertise while drawing upon their existing strengths. A passion for quality and a need to retain the story-telling elements of art drives everything they do. There is also a high level of respect for every portrait and a team of three qualified photographers with highly-specialised skills ensures that every client leaves satisfied. The personalised elements of the brand are apparent in everything they do right from the name Studio 77, which was inspired by the street number the brothers grew up on and now serves as the address for the studio. With Studio 77, Hamad and Abdalla aspire to create an inspiring space that allows clients to recreate some of their most treasured memories. After building a loyal clientele and strong reputation for themselves by introducing an international brand that focuses on children’s photography to Dubai, it was time for our clients to begin a new chapter with their own (then unnamed) brand. While the vision for this exciting concept of theirs was clear from the onset, they were certain that the final product had to adhere to the highest international standards, as this is a quality they have become synonymous with.